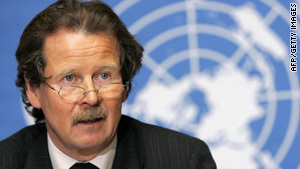 United Nations special rapporteur on torture Manfred Nowak did not accept the reason given for canceling his mission. (CNN) -- A U.N. special investigator on torture said he was denied entry into Zimbabwe on Wednesday for an eight-day trip to look into alleged attacks against opposition party members. Manfred Nowak learned that his mission had been canceled after he arrived in Johannesburg, South Africa, en route to Zimbabwe, the United Nations said in a news release. Zimbabwe said it canceled the mission to allow for consultation with southern African leaders over the country's power-sharing agreement, the United Nations said. Though Nowak applauded the consultation planned for Thursday in Harare, he said it was not a valid reason for the government to cancel his mission. The ban comes amid renewed tension between Prime Minister Morgan Tsvangirai and President Robert Mugabe. The two formed a power-sharing deal after a disputed presidential election that prompted months of controversy. The unity government has bickered constantly since it was formed in February, and Tsvangirai's Movement for Democratic Change party has accused Mugabe's Zanu-PF of human rights violations. He is saying, "'Look, we can do this [govern] unilaterally.' And that is what we are trying to oppose," Tsvangirai has said. Mugabe has denied accusations that the charges are politically motivated. "The allegation is that he's responsible for organizing arms of war against Zimbabwe," Mugabe told CNN's Christiane Amanpour in September, adding that Bennett would be appointed only if he were cleared of all crimes. U.N. officials did not say whether the special investigator's mission would be rescheduled, but emphasized the need to visit the country. "Allegations that MDC supporters and human rights defenders have been arrested, harassed and intimidated in recent days underscore the urgent need for an objective fact-finding mission by an independent U.N. expert," Nowak said.